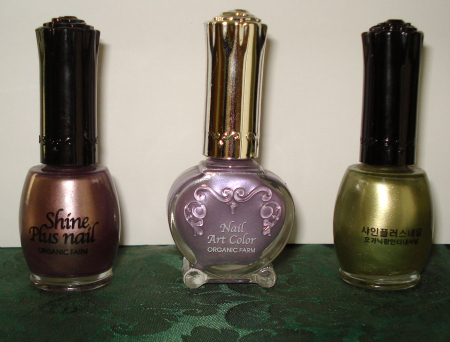 This post won’t mean too much to too many people because these three nail polishes are only available in South Korea. A few months ago I went on vacation to Japan and South Korea. Traveling is one of my other top hobbies when I can afford it and I will sell things off to do it. Except for polish, that ain’t happening. Korea is known as one of the top leaders in beauty products in the world right now and they take it very seriously. Unfortunately, I didn’t have a lot of extra money to spend as things can be expensive in that region of Asia but I did pick up a few polishes to fill the void in my polish obsession. The polishes I picked up are supposed to be healthier polishes, but the truth is I will never know as their site and other information on the web about the polish are in Korean. Though I love Korean culture and the food is amazing, the language still escapes me. I tried asking my Korean friend, but he doesn’t read Hangul, though he speaks Korean. The Application: All of the colors have a great formula. They went on smoothly with no streaking and were completely opaque in two coats. The brush was also a perfect size making the application even better. The best part was that these polishes were all $5.00 USD total because of a sale going on in the shop I bought it from. Great quality for a lower end polish. The Color: The one on the far left is hard to describe. I see it as an antique metallic rose color which makes no sense when you see metallic and antique together, but that is the best way for me to describe it. So odd. I am not a huge fan of metallic finishes or “shine” as the bottle calls it, but it’s an okay color and flattering enough on my cool skin coloring. The middle color is more of a lavender color with shimmer. This I like. It really is a pretty, gentle color that can be worn in the spring and summer. It’s quite feminine and very harmless if you need a quiet color. I can see myself wearing this one a lot more than the others. Lastly, this is the interesting limeade color on the far right. I don’t really know what possessed me to buy this one looking back. Maybe because the color was so unique I didn’t think I would be able to find it anywhere again . That may have been a good thing after seeing it on my nails. It really didn’t work with my skin tone or maybe I just can’t get past the color. I really don’t know! Still I don;t see myself using this one so much. The Verdict: In the end, it was an interesting experience, though I think I will most likely stay with the lavender color. I don’t know what I will do with the limeade color as I don’t think I could ever wear the color out in public, it just didn’t work for me. Still, I am glad I picked these up as they were a great deal and I was surprised at how nice the brushes were and how opaque the color was for such a cheap price. The one thing I don’t know is how the polish wears long term as I only swatched them. I will have to try the lavender one out for a test drive before the summer ends.